There are a lot of "backdoor friends" eating today. 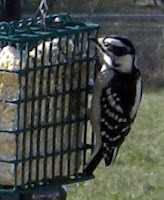 This little fellow flies up to the feeder and grabs a seed, then off to perch on the leg of this old chair and eat it. His head was down when the shutter fired so you can't see his pretty little topknot. 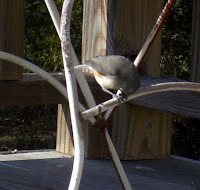 He is a Tufted Titmouse. This lady is relatively new to us. We have seen the male version but Ms. Woody is new here. 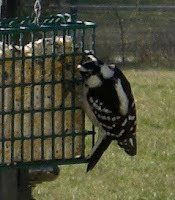 We think they are Downy Woodpeckers. 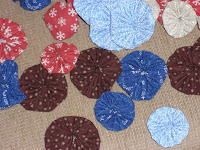 And just so you don't think I have been totally lazy here are some fabric yo-yos that I have been making. They will eventually be sewn together into a nice "quilt," or as some perfer to call it, a coverlet. Even though there will be no batting or backing, just the yo-yos sewn together, I call it a quilt. Those things are surprisingly warm. And How is your weekend going? I can't wait to see that yo-yo quilt. I have a box of completed ones from my husband's aunt that I need to do something with them. Great pics of the local visitors. I saw the yo-yo's quilting nana was given. She has thousands of them....no kidding!! She says a bunch, but there are thousands of them...I'm sure of it. Okay, I am officially jealous. LOL..I am making yo-yos every time I can. Maybe she should send me a few hundred or so.